It has been reported in newspapers that State Representative Jennifer DeChant is submitting a bill in this legislative season to provide a $60 million tax subsidy to BIW over the next 20 years. This Bill would extend Maine's Shipbuilding Facilities Credit which has delivered BIW an annual $3.5 million subsidy since the 1990s. When she received correspondences opposing this bill, she invited people to her home for a meeting to discuss this bill. She then changed the venue to the Bath Library, then changed it again to City Hall. The meeting took place on Thurs, Dec 21. Besides myself and State Rep. Jennifer DeChant, the following people were there: State Sen. Eloise Vitelli (who will be a Senate sponsor of the bill), Brown Lethem, Karen Wainberg, Jerry Provencher, Gary Anderson, Lisa Ledwidg, Lou Ensel and two VFP members who don't live in Bath, John Morris and Peter Morgan. Martha Spiess showed up early to videotape the event, and Jennifer did not allow that to happen, so Martha left. I did not know that occurred until I got home and read Martha's email. I'm sorry that happened. Jennifer reported that she did not intend for this to be a public meeting; she intended an “informal meeting.” She also reported that she is willing to hold a “public meeting” anytime. I disagree that a meeting held with constituents about pending legislation is something less than public. Transparency should be at the heart of a democratic process. I heard nothing in that meeting that an audience of Mainers would not benefit from knowing. Jennifer ran the meeting. As I understood the basics: she was asked by a constituent (BIW) to submit a bill to allow BIW to continue to receiving the tax break it has been receiving for the last 20 years. She agreed. The language for the bill is being written; it is in the legislature's Revisor's Office; BIW lawyers are assisting in drafting the language; it is important to her that language using some of these dollars for 'training' is in the bill. Jennifer and Louise described that the process is this: the bill's language will be completed soon. The Taxation Committee will take it up, and hold a public hearing. By law, the Taxation Committee needs to hold a public hearing, and give a 10-day notice to the public. When people come to the hearing, they can speak for three minutes on the bill and submit something in writing to the committee. The next step is a work session. The public is allowed to attend, but not to speak or participate. Then, if it passed out of committee, the bill goes to the floor. If passed, it goes to the Governor to sign. I perceived the conversation that ensued as civil, lively, honest and blunt. Many of those attending had many questions, and expressed opposition to the bill. My notes cannot do justice to the great questions and concerns that were expressed; I urge those who attended to add to this email any of the important exchanges that should be shared. We were urged to pay attention to the Taxation Committee agenda (Jennifer said we could sign up as friends of the taxation committee to be apprised by email of when the hearings will happen) and to show up at the hearing to express our opposition. Jennifer also urged us to stay in touch with her if we have any questions along the way. Thanks to all for paying attention to this issue. It is never too early to contact your local reps/senators to express your opinion of this bill. Consider letting them know that BIW is a strong, capable, successful shipbuilding company. 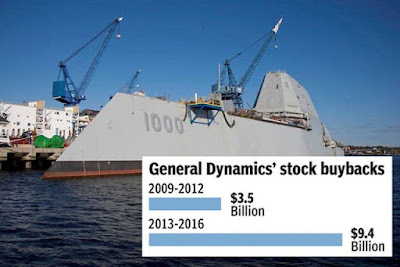 At $4 billion of taxpayers dollars a ship, they (and their parent company, General Dynamics) should certainly be able to budget well enough to meet their financial responsibilities. On the other hand, Maine is constantly stressed in its efforts to meet the needs of its constituents impacted by a decaying physical, educational, medical and social infrastructure. Create a vision for what you think might be a higher priority for the $3 million a year over the next 20 years, and share it with your State Representatives and Senators. Thanks for you attention and activity around this issue. Israeli soldiers on have arrested the mother of Ahed Tamimi, the 17-year old Palestinian girl arrested from her bed Tuesday morning at 3:00 am here in the village of Nabi Saleh. Arresting a child wasn’t enough for the Israeli occupation; now her mother is behind bars, too. The Tamimi family have lived their entire lives under Israeli military rule, never knowing a single day of true freedom. It is their right and responsibility to protest for Palestinian freedom and equality. Outside the gates of Futenma Marine Corps air base in Okinawa – really moving video - during the recent Veterans For Peace delegation. My interview on RT about space issues, done a couple of weeks ago, now available in full. I am at the airport in Taiwan heading home. Long trip ahead of me but ready to get home. 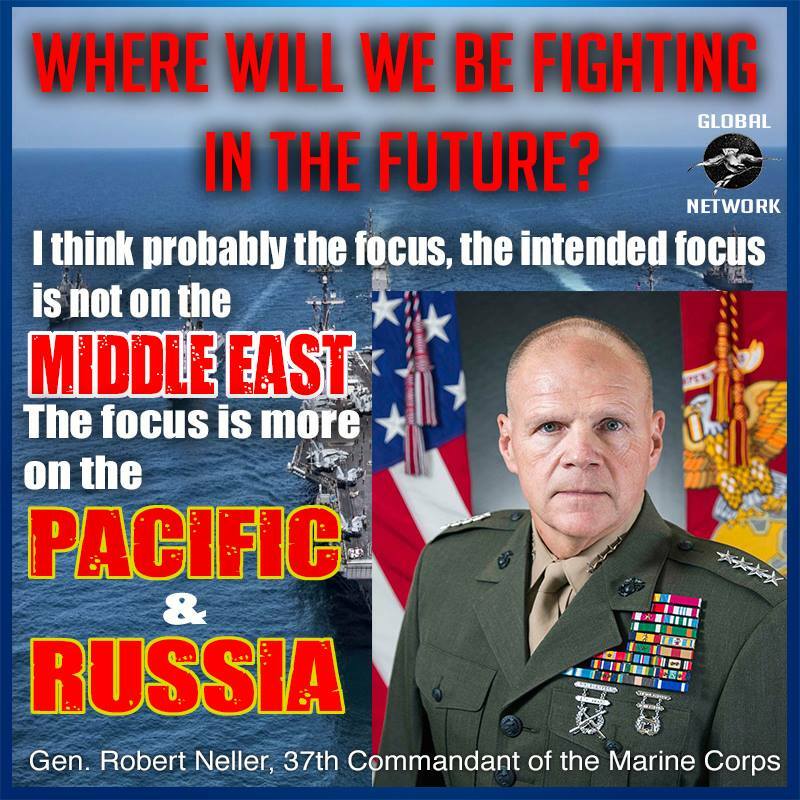 As the U.S. nears the completion of nearly two decades of combat in the Middle East, the commandant of the Marine Corps said the service is looking beyond the region and working to focus more on other parts of the world where new threats are emerging. The news that Sen. Susan Collins had ignored the wishes of the majority of Mainers on the recent Senate tax cut bill underscored just how far the greed and lack of care for the working people of this nation has gone. The overwhelming evidence that the gap between the rich and poor is growing (about as fast as the Arctic ice is melting) indicates just how little our corporate ‘masters’ care about the country. The fact is they don’t. Here in Maine we face a less well known corporate grab for the public purse. The recent news that General Dynamics is requesting a $60 million tax subsidy from Augusta is but one more shock to the system of a nation that is in decline as our human and physical infrastructure collapses due to neglect and outright abuse. 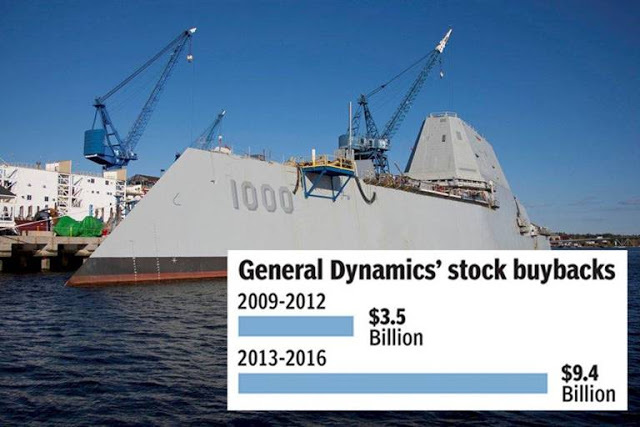 This was during the same period that General Dynamics was hitting up Maine, Rhode Island and Connecticut for more money — implying that they might have to close up shop if they didn’t get the requested taxpayer subsides. It should be remembered that when General Dynamics signs contracts with the federal government to build warships they write into the agreement all their costs (worker training, equipment, utilities, materials, profits and more). So, for the company to keep coming back saying they need even more money means they are double dipping the taxpayers. Rep. Jennifer DeChant from Bath is now formulating the bill in Augusta that will give General Dynamics even more corporate welfare. Since 1997 the company has received $200 million in tax breaks from the State of Maine and the city of Bath. The public outcry, not yet as sharp and loud as the one we’ve recently heard opposing the Senate tax bill in Washington, should now pick up as we head toward the January special legislative session in Augusta where the tax subsidy bill by Rep. DeChant will be considered. Let’s just imagine for a moment what $60 million could be used for here in our already fiscally strapped state. Fixing roads and bridges, repairing rundown schools, hiring more teachers, helping those who can’t afford healthcare, beginning to do more about our own dependence on fossil fuels as climate change worsens by the day and lobsters head north seeking colder ocean waters. Should we just surrender to the corporate agenda and turn over the public treasure chest to the already well-endowed mega-companies that now appear to be in full control of Washington and Augusta? Are people to expect few, if any, life supporting services from our national and state governments because we must first make sure that the fifth biggest weapons corporation on the planet, General Dynamics, has enough profits so they can buy back their own stocks? 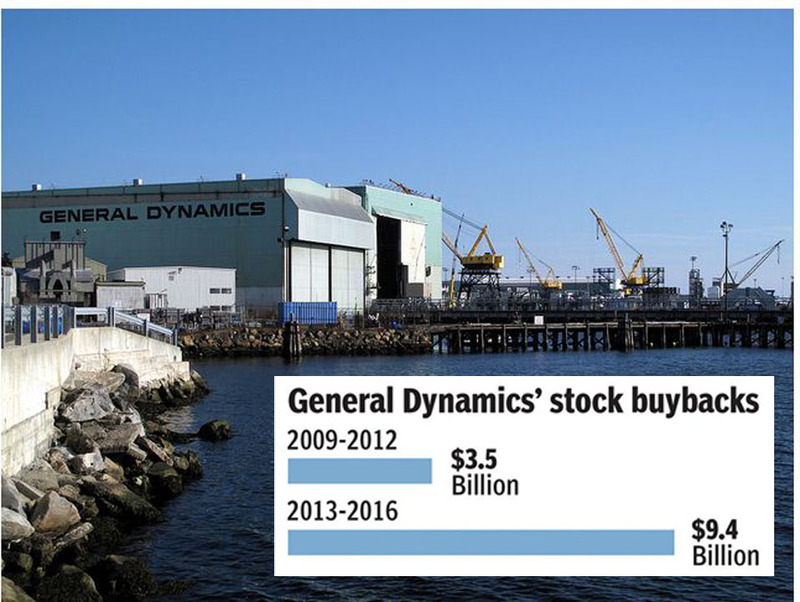 General Dynamics last year paid CEO Phebe Novakovic $21 million — which included a $5 million bonus. Let General Dynamics take back some of the extravagant pay increases and bonuses from its top executives before it comes poormouthing to our already financially barren state treasury. We have the right, and the responsibility, to speak out and demand this nonsense stops now. We are handing a collapsing nation, facing the ravages of global warming, to the future generations. The least we can do is call upon our state legislators to go to Augusta and say no to General Dynamics. Before General Dynamics gets any more state taxpayer dollars it should be required to begin a transition process to build commuter rail systems, tidal power and offshore wind turbines to help us deal with our real problem — global warming. ~ Bruce K. Gagnon is a member of PeaceWorks. He lives in Bath. Debating space colonization in Taiwan: Good seed or Bad seed? My son Julian (on right in photo) teaches debate in Taipei, Taiwan and had me speak to his students today for 90 minutes about space issues. The kids leave Friday for a big debate tournament in Beijing on 'space colonization'. The kids are middle school age and I was quite impressed at how much they already knew and how closely most of them followed the discussion. A handful of them had lots of questions with Julian adding some (and debating me as well - something he has always liked to do). We covered alot of ground - from weapons in space to planetary mining colonies. One question that frequently came up was what will happen by 2050 - will there be war in space or will there be space colonies established by then? That 2050 time frame appears to be one of the primary themes in their coming Beijing debate. Two of the moms of the kids came by to check the discussion out and one of them kindly brought me a gift of honey from Taiwan. A very nice gesture. The other mom said she met me last January when MB and I attend Julian's wedding to his wife Emily. I told them I was excited to know that students would be debating space issues because this is exactly what we need all over the world right now. Most people don't know much (if anything) about space issues so we need to slow things down so that the global public can catch up with the technology that is pushing space warfare and colonization. In the end, I said, the people and our planet are the ones that will pay the ultimate price if there are any mistakes or accidents from space technology - particularly as the nuclear industry views space as a profitable new market. So the public has the right to be involved in the debate about how our collective tax money is used by the aerospace industry that is pushing space weapons and colonization. I thanked the kids for listening and told them they were special because now they know something about this subject and that we need them to share what they know with others so that the people of the world can be involved in determining what kind of seed humanity carries into space - the good seed of love, cooperation, non-violence and sharing or the bad seed of greed, violence and competition. For homework I suggested they (and you) should watch the excellent documentary film called Pax Americana and the Weaponization of Space. What goes on at Pine Gap NSA base in Australia? Six protesters in Australia facing jail time for their actions at the US NSA space spy base at Pine Gap. The base intercepts all communications (email, phone, fax) from throughout the Pacific region and sends them back to the NSA in the US. 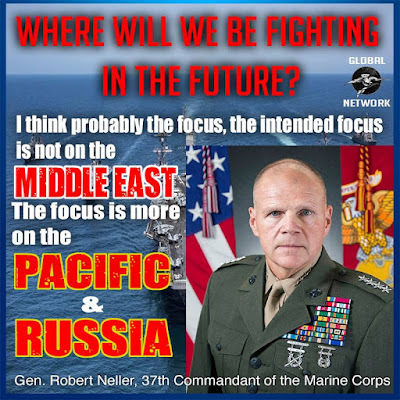 Pine Gap also aids in Pentagon drone strike targeting in the Middle East and Central Asia. A former colonel in the United States Air Force, he retired from military service to become a bank executive. Prouty subsequently became a critic of U.S. foreign policy, particularly the covert activities of the Central Intelligence Agency (CIA) about which he had considerable inside knowledge. Prouty was the inspiration for the character "Mr. X" in Oliver Stone's film JFK. Among other important topics Prouty discusses why JFK was killed by the CIA. I am reading Prouty's book now and highly recommend it to others. It is called The Secret Team. This is important history from a high level inside player. There is much to learn from Prouty and it indicates to me how the CIA now runs the US government (the deep state) and much of the world as well. Last night Julian and Emily took me out for dinner. First we walked through the night market - very crowded - and we got some stinky tofu. Quite a good taste but it does smell bad. Then we went to the ginger duck restaurant and the food was quite excellent. A couple of beers helped wash it all down. Today we went for a two-hour massage - only $40 each - a real deal and I can say it was the best massage I've ever had. In Maine you'd pay three times as much for a two-hour massage and it would not be nearly as good. I was warned not to ask for the Thai massage - apparently they beat you up pretty bad when you get that one. The massage therapist worked on my shoulders the most which were a real mess after sleeping on the floor a couple nights and getting dragged around by police at Camp Schwab in Okinawa. I've been 11 days without pasta so we went to the grocery store and bought the fixings for pasta which I cooked tonight. Bought a bottle of Italian wine to go along with it. I am a happy man now. Tomorrow I speak to some of Julian's debate students who leave on Friday for their 'space colonization' debate in Beijing. Should be a great experience for me - really looking forward to it. 731 - How America Exploited Japan's Biological Weapons Crimes from Paul Johnson on Vimeo. Japan's 731 Biological Weapons unit committed some of the worst crimes against humanity in modern history. "731" is the story of their atrocities and how the US chose not to prosecute its leaders in exchange for data they obtained from human experimentation. Soon after arriving in Taipei, Taiwan today my son Julian and his wife Emily took me for a great Chinese lunch and then a long walk up a nearby mountain that overlooks the city. Their dog Junior came along with us. It was quite a climb up the cement steps to the top - quite steep. Near the top was the famous Grand Hotel. Julian and Emily were married in the other Grand Hotel in the city of Kaohsiung. The rooms were the biggest I'd ever seen in any hotel - a really beautiful place. Taipei has a metro-area population of 7.4 million people. The immigration process to get into Taiwan took me 50 minutes to get through - longer than any other country in my memory from my travels over the years. It is really great to be there - my third time visiting with them - the last two times Mary Beth was with me - wish she was here this time as well. I stay until Friday and then head home. It's been a great trip - the time our Veterans For Peace delegation spent in Okinawa was a remarkable experience. We had a number of younger veterans (men and women) with us this time and most of them had not been on an international peace delegation before. So it was a very interesting process to see them mature throughout the 10-day visit. I know they learned a whole lot and there were many very emotional and moving moments as they confronted their own issues from the military. There can be no doubt that trips like these change the lives of American citizens when they see the reality of US militarism from the other side of the base barbed wire fences. Activists come home seeing what the US military empire does to the local culture, environment and the people with new eyes and a stirring in their hearts like never before.